I originally wrote about this delicious recipe several years ago and have republished it a few times since then to share as a fun St. Patrick's Day recipe, but I never expected it to become such a popular post even though the recipe is out of this world. Below is a Mom Squad segment on Fox that I recently filmed on how to make the Best Crockpot Potato Soup Ever! I like to make potato soup for my family on St. Patrick's Day, and I can't wait to share a recipe with you that I have used for the past few years. If you haven't read any of my other recipe posts, I have to let you know that I LOVE recipes that are easy and delicious and this one is both! Many people say it's better than Outback's potato soup and my family agrees. It's really mouth-watering so get ready to go shopping for the ingredients ASAP! In a crockpot, combine everything except for the cream cheese. Add any extra ingredients you may like in your soup, such as sauteed onions, mushrooms, and shredded cheddar cheese. My family likes our potato soup extra cheesy so I add it to the soup while cooking. Cook for 6-8 hours on low to medium heat until most of the shredded potatoes are dissolved. Some people prefer some shredded potatoes for extra texture but my family likes most of them dissolved to make the soup thicker. Add cream cheese about an hour before serving and keep heated until thoroughly melted. Avoid using fat-free and generic cream cheese when making soups because it tends to leave small clumps in the soup. Go with the name brands. Even though this soup is great served with bread, especially French bread, my kids really like eating it with tortilla chips. They scoop it up with the chips, which makes it an even bigger hit with them! 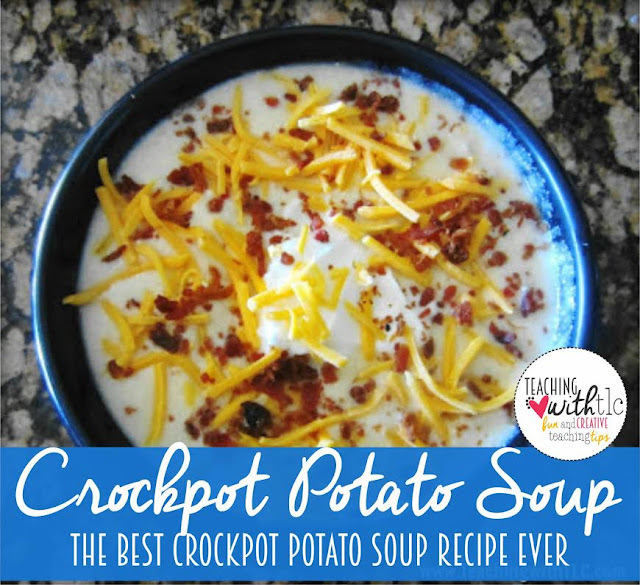 You can cook this on your stove top for about 2 hours if you do not have time to use a crockpot. Just be careful not to burn the bottom of the soup. My family treats our potato soup like a baked potato so we love to load it up with toppings. I actually set up a toppings bar and they can choose what they like. This is also a unique recipe to make for guests since people have fun adding their own toppings.